“The problems are not just technical – they’re also social, and they’re also political,” Gilron said. Sitting in Gilron’s office in the network of buildings, trees and concrete paths that make up Ben-Gurion University of the Negev, it was easy to forget that we were in the middle of the desert in a country with a vastly different political system than the United States when it comes to water. In Israel, almost all water belongs to the State of Israel. From the limited freshwater and groundwater to the more abundant sea water and even wastewater, every drop is a national resource to which the public is only granted temporary usage based on need and availability of sources. This allows Israel to control the water on a countrywide level and prioritize who gets it – and when. 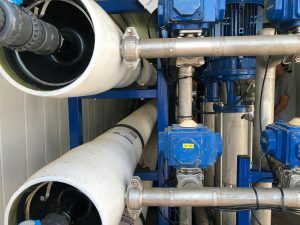 One of the benefits of this setup, Gilron said, is the ability to control how much groundwater and freshwater is pumped from different sources. This is increasingly important as Israel enters its sixth consecutive year of drought and groundwater and freshwater levels continue to drop, forcing the country to rely more on wastewater reuse and desalination to avoid causing irreparable damage to their aquifers and to the Sea of Galilee. This also enables Israel to implement nationwide conservation initiatives. Israeli residents grow up with a conservation-first mindset, said Dr. Elie Rekhess, associate director for Israel Studies and visiting professor in the department of history at Northwestern University. Rekhess grew up in Israel during the infancy of Israel’s National Water Carrier system, and his wife and children still live in Tel Aviv. Most of Israel’s drinking water is supplied by five seawater desalination plants along the Mediterranean Sea. Treated wastewater is used primarily for agriculture, which receives 546 million cubic meters (about 144 billion gallons) of freshwater to supplement the 473 million cubic meters (about 125 billion gallons) of treated wastewater provided each year. Israel is able to transport its treated wastewater to farms all across the country because the country is less than the size of the state of New Jersey. “When you’re small enough, the distance between where you generate the water and where you need the water is small enough that the cost to transport the water is reasonable,” Gilron said. In a country as large as the United States, or even in an expansive, drought-ridden state such as California, the transportation costs between large municipalities where the wastewater is treated and the agricultural areas where the water is needed might be too cost-prohibitive to allow water reuse for irrigation, Gilron said. Gilron recommended that other countries think local if they want wastewater reuse to work effectively, but also advised that wastewater treatment can’t and won’t be the only solution to the global water crisis. Officials at Shafdan Wastewater Treatment Plant, Israel’s main wastewater treatment facility, are constantly researching new ways to make their treatment process more efficient, but overall, the current processes do not vary significantly from those in other countries. Israel’s wastewater, which is funneled primarily through Shafdan, is treated in a multi-step process that includes basic filtration and biological treatments and ends with a natural form of filtration called soil aquifer treatment (SAT). SAT allows the country’s abundant sand to filter remaining pollutants from the water – a six-month to one-year filtration process which deposits the water in an agriculture-specific aquifer beneath the filtration fields. Shafdan researchers have narrowed alternatives down to two approaches, Bleich said – more pretreatment before using SAT to allow for more expedited filtration, or focusing on new technologies that could achieve comparable water quality to using SAT. While reusing treated wastewater for agriculture has allowed Israel to become relatively water solvent, concerns remain about using treated wastewater to grow crops. For example, Israel’s current processes are effective at removing some organic compounds present in effluent, but research is not conclusive on any long-term danger from irrigating crops with water that may still contain endocrine-disrupting compounds (EDCs) found in birth control and hormones, which may not be removed by traditional treatment processes. Gal Shoham, professional instructor in the operation and process department at Shafdan, said the levels of EDCs were too low to be of concern. But Bleich said, later, that removing EDCs was a target for “all the pilots,” meaning for all the test studies Shafdan researchers are currently performing. In addition to reusing wastewater, Israel’s desalination plants and countrywide water conservation campaigns have given the country some distance from total water scarcity – quite an accomplishment for a country riddled with drought and with little available fresh water. There is still room for innovation in wastewater treatment, Gilron said. While other countries may be circumstantially different from Israel, they can still move toward a more sustainable treatment and reuse model. Photo at top: Israel is largely a desert region with little available fresh water, so every drop matters. In order to fulfill the country’s water needs, Israel uses sea- and brackish-water desalination, groundwater and freshwater pumping, conservation campaigns, and wastewater treatment and reuse for agriculture.